Swedish game developers Coffee Stain Studios are back with another installment in the glorious celebration of the absurd that is their Goat Simulator franchise. The aptly-titled "Waste Of Space" sees the mentally deranged bleeting animal take off to where no goat has been before – space! Even if you aren't 'feeling' the Goat Simulator games for some reason (such as being a calm, well-adjusted individual who's functional in society), the trailer for this one alone is worth it. Not that we're going to spoil it, because missing out on it is something you will regret forever, and possibly in your afterlife. But the screenshots might give you a hint or two of where "Waste Of Space" is headed at. Help us! You are our only goat! 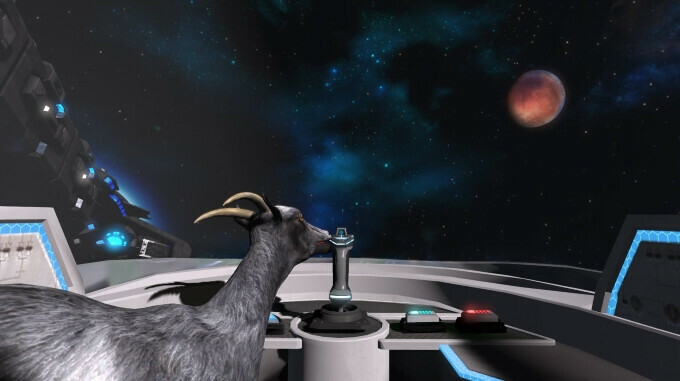 Naturally, Goat Sim is bustling with tongue-in-cheek humor aimed at the gaming and pop culture at large. This has to be the only game out there where you can crowdfund a space colony via the CrowdKicker platform, getting other people to pay and also do all the work. You can also pilot spaceships and shoot lasers while still being a goat, fight dark jedi with rainbow lightsabers, explore a space base full of space things to throw around and break, romance crewmembers, and do other epic stuff. Goat Simulator might be a waste of space, but the hours spent with it won't be wasted. Okay, there's always something better to do in life than being a glitched-out goat in space, but in the end, that's up to you to decide. And besides, the game is solid comedy gold! Goat Simulator - Waste Of Space is available on Android, iOS, Amazon devices, and PC.